My baby is now ten months old, and we are all fighting illnesses daily, courtesy of daycare germs, BUT this has given me the time to read and write! So, after being out of touch for so long, I am proud to be able to present my first review, post-birth : ) Enjoy! 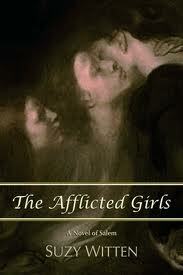 The Afflicted Girls by Suzy Witten. Dreamwand, 2009, $18.95, paperback, 978-0615323138, 456 pp. Kindle edition, $4.99. Why would someone be doing this, my mind wondered. The slave is digging an infant-sized grave during the funeral of the youngest Putnam male, which is going on inside the church. He describes the screams of the mother, the reaction of the father to his wife’s hysteria, the pompous, condescending attitude of the reverend…setting the scene for this sad tale. The arrival of two orphans, Abigail Williams and Mercy Lewis, shortly afterward, marks the beginning of the evil-doings that lead to the eventual witch-hunts. Abigail, the niece of Rev Parris—the greedy and corrupt, yet conflicted Puritan leader of the small town—is herself no angel, being power-hungry and manipulative like her uncle, and has arrived to live with her newly found family. Mercy, a humble orphan of few means but many skills, is forced into indentured servitude in the Putnam household. The story leading up to the arrests and trials themselves is peopled by a large and complex cast of characters, with the overwhelming majority being difficult to sympathize with in any way—miserable creatures, most of them, with the exception of Mercy and Lucy Putnam. The plot also distills the essence of village relationships, which eventually underlie the hysteria of the trials, with its rivalries, history, and petty politicking. The Afflicted Girls is written in a sophisticated, literary style that expresses the corruption, hopelessness, and despair pervading the story. Frequent changes in character points of view, which can be problematic in a work of fiction, are seamless here, avoiding a focus on just one or two main characters. Normally, I would have disliked this technique, but in this instance, one does not want to become too emotionally engaged with such abhorrent creatures or too attached to those who suffer miserable fates. I think the level of attachment/detachment is just right: we are drawn in but not overwhelmed. We are challenged enough by this story to be led to consider human weaknesses and their effects on others, such as lust, corruption, interpretation of religion, and greed, and to want to ponder human nature and how it can be swayed so easily toward these things. A small amount of the mystical is woven into the story, almost attempting to illustrate that “white magic” or “witchcraft” (intuition and visions, for example) can be positive, not negative (or “of Satan”), as the reverend turned these traits around to be. The author also introduces a theory that the “afflicted girls” were not possessed by witchcraft or anything supernatural, but rather were under the influence of an hallucinogen—a natural substance baked into cakes that the parsonage’s female servant (with the assumption that she brought this knowledge with her from her native land) used for her own private ceremonies. In this book, Abigail recklessly (and fatally) attempted to replicate this recipe—a claim that is well expressed and defended throughout the story, as the use of herbs for visions has long been practiced by many cultures, but in this instance, was turned into evil, devil-worshipping fare by petty minds. The book is not perfect, however. I would have preferred a tighter set-up for the story; it is clear that the story was intended as a screenplay originally, because the first one hundred or so pages are scene-setting descriptions of both people and places, without much action. I think readers would have found this book easier to get into had the beginning been more tightly woven. Patience is necessary to get to the meat of the novel, but it is absolutely worth the effort. Secondly, a descriptive character list in the front matter would have been helpful as well. For a novice on the subject of the Salem trials, such as myself, attempting to keep up with the complex list of characters impeded the reading flow. And thirdly—and this is a nitpicky detail of a manuscript editor who reads day in and day out—I noticed an overuse of dependent clauses (sentences starting with the subordinating conjunctions “because” or “since”), posing as independent sentences, which was jarring. Used judiciously, this technique can enhance a work, but when overused, it becomes a distraction. There are a number of typos, as well. The book (both print and e-book editions) could use a thorough copyedit. Overall, these are minor quibbles. One of the highest praises I can give a book is when I continue pondering it long after I’ve closed the cover (or turned off the Kindle! ), and the atmosphere and issues from this novel have been rattling around my mind ever since I finished The Afflicted Girls. Disclaimer: The reviewer is acquainted with the author but has not allowed that relationship to interfere with writing a fair and balanced review.